According to a recent study by eDigitalResearch, 78% of consumers agreed that they would be happy to receive personalised messages from retailers. As various industry verticals get to grips with the technology behind beacons, consumer opinion indicates that these low-cost pieces of hardware have a huge potential to revolutionise experience across industries. iBeacon technology opens doors to engage customers where it matters most, benefiting both the customer and the business. In the last few weeks, we have discussed how beacons can be used in museums, stadiums, hotels, airports, and events. Although beacons are gaining momentum, many businesses are struggling to figure out how to integrate beacons with their existing mobile strategy. We recently published a blog on ‘Adding iBeacon to Your Mobile Strategy‘ on Beekn. It talks about seven steps every brand should take prior to launching their beacon strategy. Also contains seven key takeaways that will help you integrate iBeacons into your marketing strategy with ease. To reap the benefits of iBeacon technology, you need to have a mobile app with which the beacon can communicate and interact with. Most brands are trying to enhance their customers’ experience by adding location-based elements such as indoor navigation, contextual notifications etc., to their existing app. Retail brand, Tesco, recently deployed beacons to push messages through their app to notify customers in store, when their online order is ready for pickup. Once your customer is in close proximity to specific beacon, the app will listen for beacons and sent a message through the lock screen. Thus, it helps you enhance your customers’ shopping experience through effective customer service. You can also choose an existing generic app, such as a one that is optimised for your target market say museums or stadiums, and then use dedicated tools provided by them to customize the app to your needs. This way, it not only helps you easily provide a rich user experience, but also simplifies app development to a great extent. For example, Fluwel’s Tulpenland (Tulip Land), a theme park that specializes in displaying Dutch tulips, recently customized mApp, an app developed by LabWerk specifically for museums, that wish to offer a good experience to their visitors. The app uses interactive content such as images, video and audio to tell the story of tulips in a very personalized manner. If you don’t already have an app in place, then this is probably the best way ahead. The main advantage here is that you will be providing your service through an app that already exists on your customer’s smartphones. Adding on to that, there are other companies that offer services allowing brands to take advantage of an already existing iBeacon network. Condé Nast’s 19-year-old recipe warehouse, Epicurious, for instance, leveraged inMarket’s iBeacons to deliver push notifications on recipe suggestions to shoppers’ apps and thus drive in-store sales. While mobile apps are one of the most commonly used ways to leverage beacons, they are not the only ones. You can also tie up with Passbook, an existing ‘utility’ application on Apple devices, with your iBeacons. The primary advantage here is that, it does not require your customers to download a third-party app. If you already have a branded app that is used and valued by your customers, then you can easily build upon it by adding location-based elements to the app. On the other hand, if you do not have an app, you can simply integrate with an existing sales app or Apple’s Passbook. When it comes to location-based mobile marketing, it is highly crucial that you have a strong understanding of your customer’s context, including their purchase history, current location, and proximity to beacons to push relevant content and access to services. At the same time, you must ensure that you don’t overwhelm your users with notifications, as it could nudge them towards opting-out or un-installing your app. Going ahead, once you deploy beacons in large numbers across the country, remote beacon management will become highly important. This requires beacons to have some sort of network access while empowering brands the ability to detect each beacon, and turn it on or off via backend. Read the full post on ‘Adding iBeacon to Your Mobile Strategy‘ on Beekn to learn how you can implement a context-heavy iBeacon strategy to enhance customer engagement, improve sales and create brand awareness. 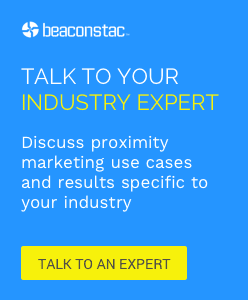 Also contains seven key takeaways for integrating beacons into your marketing strategy.